ssk is an abbreviation for slip, slip, knit. 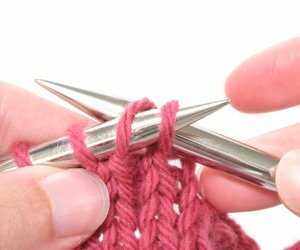 It involves slipping two stitches from the left needle to the right needle (one at a time, please) and then working them as though they were one stitch using an interesting maneuver illustrated below. Completing an ssk creates a decrease in your knitting because you are getting rid of two stitches and replacing them with one stitch. This decrease slants to the left. 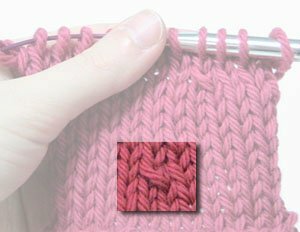 If you are decreasing evenly on both sides of your fabric to create a point (such as the top of a mitten) or shaping armholes, you would want to use this technique on the right side of the front of the garment. On the left side you would use a right slanting decrease such as k2tog (knit 2 together). Slip one stitch knitwise, then slip a second stitch knitwise. Insert left needle through the front of both slipped stitches from left to right. Complete knit stitch by wrapping yarn around right needle and pulling through. This is what your completed ssk will look like a few rows later.